New sweet cherry from the Research and Extension Center in Prosser, WA. Resembles Bing with good size and firm, round fruit. Good flavored fruit which matures two weeks ahead of Bing. The tree is upright and vigorous. Trial plantings recommended. 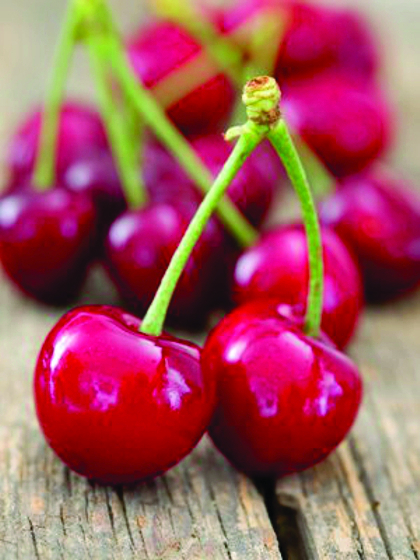 BlackPearl® is one of the best cherries in it's season, ripening 10 days before Bing. It has exceptional flavor and is extremely firm and crunchy. Medium size with 20% sugar. Has amazing storage qualities and keeps better than almost any other cherry. It is hardy and canker resistant with low cracking. Early season bloom. Fruit is large, glossy red and attractive. Very sweet flavor similar to Bing. Ripens 6 to 10 days ahead of Bing and of high, export quality. Bears early and an excellent pollinizer. Firm cherry with cracking resistance similar to Bing. This Rainier-type cherry matures seven tot ten days before standard Rainier. The cherry has a mild flavor and is medium to large in size. Early Robin® is heart shape in appearance and has a semi-freestone pit. Pollination is required but Van should not be used due to incompatibility issues. Fruit is medium size, good flavor and firm for an early cherry. Vigorous with midseason bloom. Cracking may be a concern. 8 days ahead of Bing. Self-fertile. A large, black cherry that shows good resistance to cracking. Very productive and bud hardy tree. A good pollinator. Fruit is dark red and attractive. 6 days ahead of Bing and juicy. Bears early and an excellent pollinizer. Same pollination attributes as Van. May be picked stemless. Large, dark red cherry with a glossy appearance similar to Bing. May color slowly. Self-fertile, blooms early and crops well. Good pollinizer for Chelan. Fruit almost black when fully ripe. Very large, excellent quality, firm, juicy and sweet. One of the best shipping and fresh market varieties in the U.S. Will not pollinate Ulster, Royal Ann, Emperor Francis, or Lambert. Self-fertile cherry with size similar to Bing. Later blooming than Bing. Excellent flavor with good aftertaste. Also from Prosser. Flesh is dark and of high quality. Fruit is large, dark red, and firm. Will not pollinize Royal Ann, Bing, Emperor Francis or Lambert. Very attractive yellow cherry with a red blush similar to Royal Ann. Fruit sizes well even with a full set, and a distinct flavor superior to most varieties. A large, high quality white cherry with red blush. Very productive. Will not pollinate Ulster, Royal Ann, Bing or Lambert. Large, highly split-resistant, self-fertile Lambert type. Gaining widespread popularity in Canada and the U.S. Commercial testing to date has been promising. An excellent pollinator. A very productive clear yellow cherry, which is extremely hardy. Excellent pollinator. Small, firm-fleshed fruit of excellent quality used for Maraschino processing. A large (9 row) cherry which is firm and self-fertile. Dark red to black skin and flesh, a very good cropper and reated very high in taste panels. Holds up well in storage. Major new commercial dark red variety. Late blooming and late ripening. Large cherry. Will not cross pollinate with Van. A very late bright red cherry that remains "crunchy" when picked and eaten. To achieve good fruit size, pruning is essential or overcropping might create a size problem. Self-fertile. The leading sour cherry for commercial canneries. Medium size, dark red, good quality and flavor. Clear, yellow flesh inside. One of the most popular sour cherries grown. Self-fertile. Mazzard is the most popular cherry rootstock grown in North America. Its fibrous root system makes Mazzard a good choice for wet and heavy soils. Produces what is considered a "full size tree" for cherry trees, usually 18 to 20 feet tall. Performs well in deep soils with good drainage. Very cold-hardy and precocious, as well as deep-rooted. This rootstock produces a tree roughly 70% of Mazzard in size. Not recommended for heavy soils or areas with poor drainage or high water tables. Produces a tree roughly 65% of Mazzard. Needs support. Quite virus-tolerant. Does well in heavy soils. Some suckering may occur. This rootstock produces a tree about 80% of Mazzard, but induces cropping much sooner than Mazzard. Varieties budded onto Gisela® 6 do not crop in clusters the way Gisela® 5 may, thus fruit size might be larger. This rootstock produces a tree about 100% of Mazzard. Very precocious and productive. It has good virus resistance and no suckering problems. Well anchored, but support is recommended. Clonal cross of Mahaleb and Mazzard. A vigorous tree about the same size as Mazzard, but more productive and produces no root suckers. It is moderately tolerant to Root Rot and adapts to a wide range of soils. Produces a tree roughly 100% of Mazzard, but much more precocious. Similar to other Krymsk®, in that flower densities are less than other dwarfing cherry rootstocks, helping to balance out the crop load on the tree. May sucker.